Minju Kim, final-year student at the Antwerp Fashion Department, Royal Academy of Fine Arts - Artesis Hogeschool Antwerp won the H&M Design Award 2013 today. The award was presented this morning during a catwalk show at Stockholm Fashion Week. Minju Kim participated with her 3rd Bachelor collection 'Dear My Friend', she receives €50.000 and her pieces from the winning collection will be sold at selected H&M stores worldwide. The H&M Design Award is an annual initiative to support and encourage future fashion talent. Bachelor students from 19 major fashion colleges in eight European countries were invited to participate. For more info visit: http://designaward2013.hm.com. Maureen Declercq, teacher at the Antwerp Fashion Department: "Minju Kim's use of colour in combination with new studies on coupe and her eye for perfection and finish makes her an excellent student at our Academy. We are very proud that thanks to Minju Kim and H&M this unique 'Antwerp' vision will be spread worldwide. Minju had the opportunity to develop her vision on fashion during her Bachelor year. From her inspiration and artistic graphical drawings she learned to realize a contemporary collection at our school." 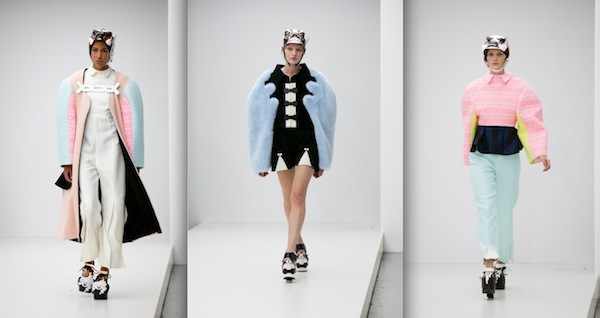 Walter Van Beirendonck, head of the Antwerp Fashion Department: "This Award is a great recognition of our individual and very specific way of teaching and for the hard work of Minju Kim in particular, but also for the whole team of teachers and students at the Fashion Department. It is also a fantastic start of 2013, the year that both the Royal Academy of Fine Arts Antwerp will celebrate its 350th anniversary and the Fashion Department its 50th anniversary with an exhibition at the MAS and MoMu in Antwerp in September!"